The cheeks are expressive muscles of the face that help to express a variety of emotions. For many women, the cheeks are one of the ways that a woman may silently convey her emotions to others, by presenting expressive looks that display their outer beauty, express their inner emotions, attract attention, make a fashion statement, and create an image of captivating desire. ISOMA's Kissable Cheeks Collection has been designed to help enhance these expressions. ISOMA's premium-quality Kissable Cheeks Collection glide on smoothly and blend easily on the cheeks. The Kissable Cheeks Collection comes in a sleek looking palette that contains a mirror inside the lid and a professional brush in the lower compartment. 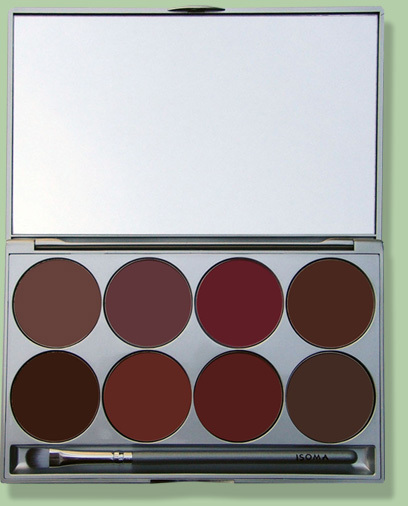 Both the palette and the brush are a valuable and reusable keep-sake once the palette is empty. ISOMA's Kissable Cheeks Collection are available in an blushing array of colors for enhancing the cheeks, and for creating a variety of moods, expressions, and designs, such as: natural, fashion, character, unique, or special effect looks. The actual shades are not exact matches to the colors shown, due to the fact that the above colors are electronically reproduced. These sample colors and the below shade descriptions should be used as a guide in helping you to select ISOMA Cosmetic Kissable Cheek Colors as your choice of Cheek Color product. 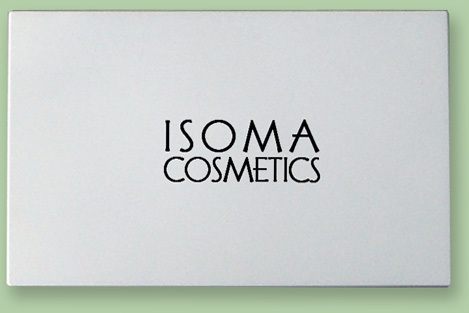 ISOMA COSMETIC KISSABLE CHEEK COLORS ARE ONLY $100.00 FOR ALL EIGHT PALETTE SHADES. The Kissable Cheeks Collection may be used for enhancing the cheeks, blushing the eyelids, and for applying color harmony to the entire face, ears, neck and breast area. Apply the Kissable Cheeks Collection of colors with a plush blush brush. For a natural daytime appearance, apply a soft neutral shade, and for upscale daytime or evening looks, select a deeper shade for a more intense or dramantic effect. Color harmony is visually pleasing to the eye and attracts the attention of others by creating a pleasing sense of order and balance. Create color harmony in your makeup application by applying a light amount of blush color (that is in the same color family as the eyeshadow and lipstick shades, which are also coordinated with ones wardrobe,) to the hairline, jawline, ears, neck, and breast area.